Aurélie Harou’s research aims to improve household food security to reduce poverty and malnutrition. She examines how economic, political or climatic shocks affect human welfare, nutrition and household production decisions. She studies how social safety net programs such as food aid as well as tools like index-based insurance can be optimally designed to help mitigate these shocks. She also seeks to understand what drives smallholders to adopt, not adopt or disadopt certain technologies, e.g., organic and inorganic fertilizer or specific crops, and the welfare and nutritional implications of these choices. Finally, she studies how smallholder production decisions affect the environment and what incentives can be created to ensure food security is achieved in a sustainable way, e.g., preserving groundwater reserves. These issues have brought her to conduct field research and work in Ghana, India, Honduras, D.R. Congo, Guatemala, and Tanzania. She uses a variety of techniques to study these issues, from running field experiments and randomized control trials to using observational nationally representative panel household data and time series climate data. While her work is largely empirically driven and tested, it relies on underlying theoretical models. 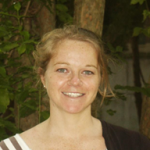 Aurélie Harou joined the AgCenter as a Postdoctoral Research Fellow in September 2013. She holds a Ph.D. in Applied Economics and Management from Cornell University, an M.S. from the University of California at Davis in Agricultural and Resource Economics, and a B.Sc. in Environmental Science and Geography from the University of Sussex, Brighton. Harou A. and Upton J., Gómez M., Barrett C. and Lentz E. 2013. “Trade-offs or synergies? Assessing local and regional procurement through comprehensive case studies in Burkina Faso and Guatemala”, World Development 49: 44-57. Violette W., Harou A., Upton J., Bell S., Barrett C., Gómez M. and Lentz E. 2013. “Recipients Satisfaction with Locally Procured Food Aid Rations: Comparative Evidence from A Three Country Matched Survey,” World Development 49: 30-43. Harou A., Kniveton D., Frogley M. and Lajoie R. 2006. “The Influence of the Indian Ocean dipole mode on precipitation over the Seychelles,” International Journal of Climatology 26:1, 45-54.